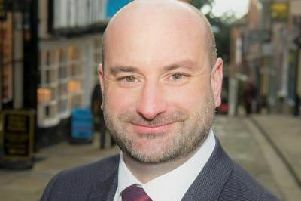 Labour’s parliamentary candidate for Louth and Horncastle Matthew Brown has turned up the heat in his bid to succeed Sir Peter Tapsell. Mr Brown has hit out at the Government for failing to take strong action against energy companies. He says the companies are reluctant to pass on savings to customers - despite a significant reduction in the price of energy. Mr Brown has also called for more to be done to help carers and equal pay. On energy, Mr Brown said: “Thousands of people in Louth and Horncastle have been ripped off by the big energy firms who never seem to pass on savings to customers. Mr Brown believes new powers should be brought in for the regulator to cut bills and force energy companies to pass on savings to customers. He said that if Labour wins the election, the party would be committed to making “big changes” to the energy market. He said he had written to Business Secretary Vince Cable demanding to know why the Government continue to block action on equal pay. He said MPs voted overwhelmingly in favour of measures for pay transparency that would see big companies (with over 250 staff) publish their gender pay gap. However, he said the Government has so-far refused to implement it. He added: “Up and down Louth and Horncastle, women and their families will be wondering why this Government won’t take action on equal pay. “I’ve written to the Business Secretary calling on him to support equal pay and get on with implementing pay transparency. “Women across Britain are still earning on average 81p for every pound a man earns, leaving themselves and their families poorer. Mr Brown also went on to call for more support for unpaid carers. He said the latest statistics showed there were 12,637 people in Louth and Horncastle caring for elderly or disabled relatives. He pointed out unpaid carers make a huge contribution to their families and society yet many of them feel pushed to breaking point, seeing their own health and income suffer. Mr Brown said Labour would be placing a new duty on the NHS to identify family carers, so they can get the right help and support. They would also give carers a new right to ask for an annual health check – allowing problems to be identified earlier and prevent costs escalating. He said: “Families in Louth and Horncastle do an incredible job looking after their loved ones, but from the conversations I’m having it’s clear many family carers are struggling.